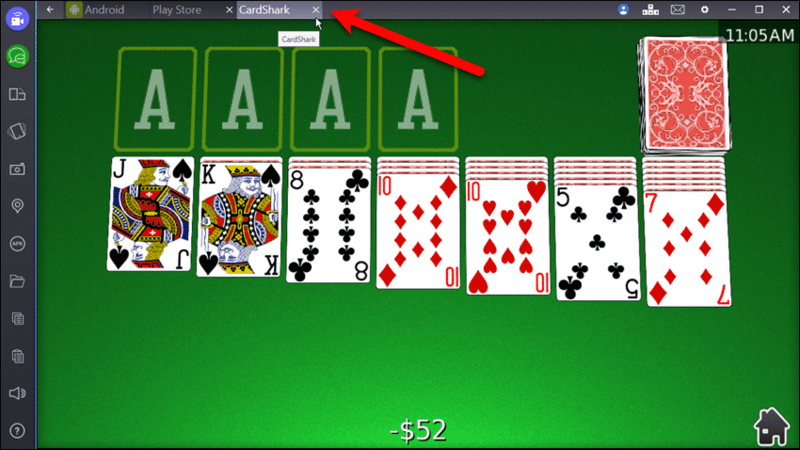 BlueStacks is a program that emulates the Android operating system on a computer. You can run your favorite Android apps on your Windows or Mac desktop or laptop, and it is free to download and use. It is ad-supported, but there is a premium subscription available that removes the ads and provides priority technical support if you want it. NOTE: The current version of BlueStacks only runs Android 4.4.2 KitKat and some apps may not run on older versions of Android. Also, multi-touch (using multiple fingers at a time on the screen) doesn’t work unless you have a touch-screen monitor. 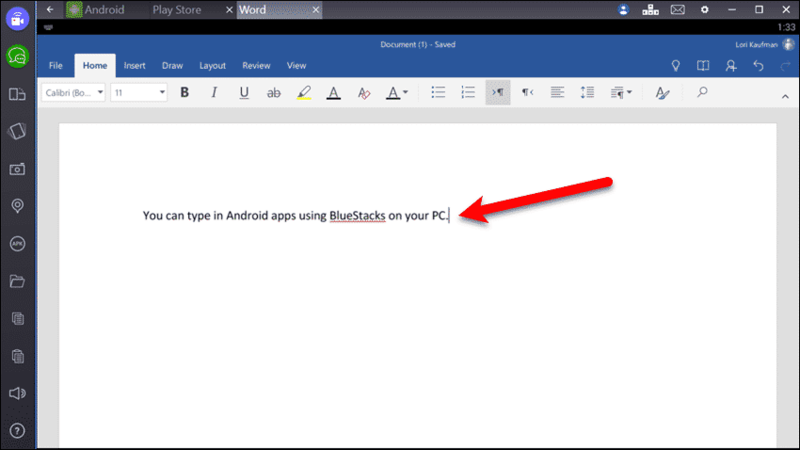 Why Use BlueStacks To Run Android On Your Computer? You can install and use the Android Software Development Kit (SDK) to emulate Android, but that’s a complicated process. BlueStacks is essentially a self-contained virtual machine running the Android operating system and the Play Store comes pre-installed on it. You can install and set up BlueStacks, and start running your favorite apps in a very short amount of time. 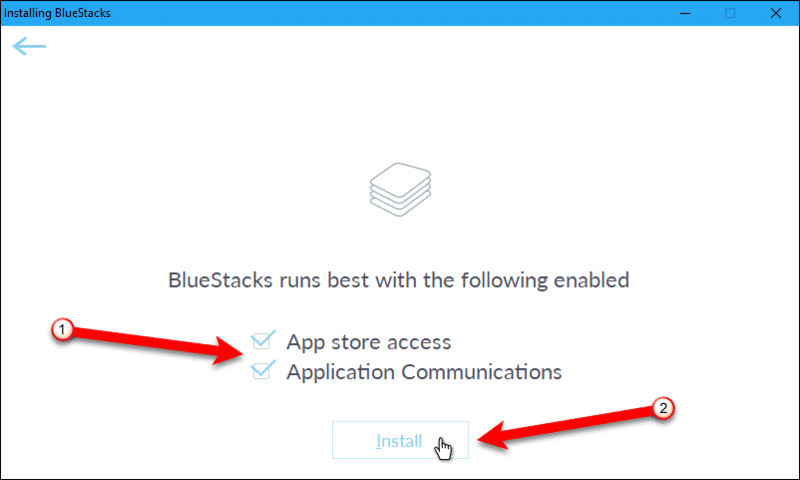 If you want to try an app, but you don’t want to install it on your phone or tablet yet, you can install it in BlueStacks to test it first. You can even install apps from outside the Play Store by importing and installing “.apk” files in BlueStacks from your computer (more on this later in the article). Some games available for Android would benefit greatly from a larger screen. BlueStacks allows you to install most games that will run in Android 4.4.2 KitKat and earlier. You can even play games in full screen mode. Click the “Toggle Screen” button in the upper-right corner of the window to enter full screen mode. Press “F11” to return to the normal window size. If you want to use a physical keyboard to type in an Android app, BlueStacks is a good way to do this. You can type notes in text apps or even in Microsoft Word for Android. BlueStacks is available for Windows and Mac, but this article only covers the Windows version. We tested the Mac version, and the Windows version seems more similar to an Android device. To get started with BlueStacks, download the installer and run it. You’ll be taken through a typical installation process. Accept the defaults as you go through the installation wizard. 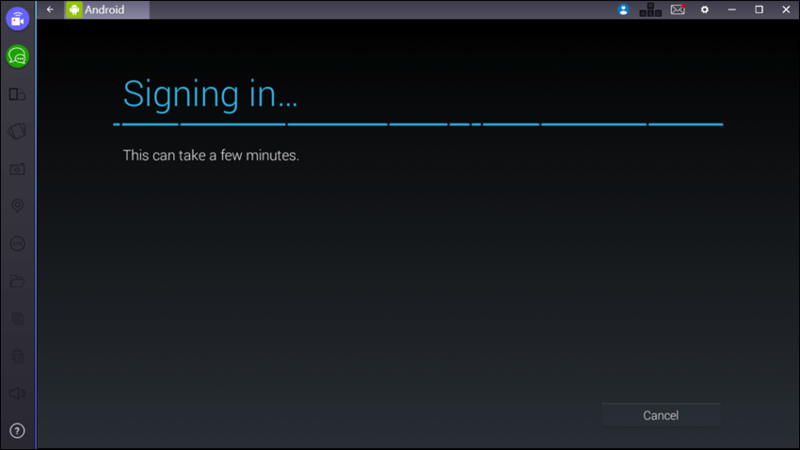 When the following screen appears, make sure both checkboxes are ticked and then click “Install“. 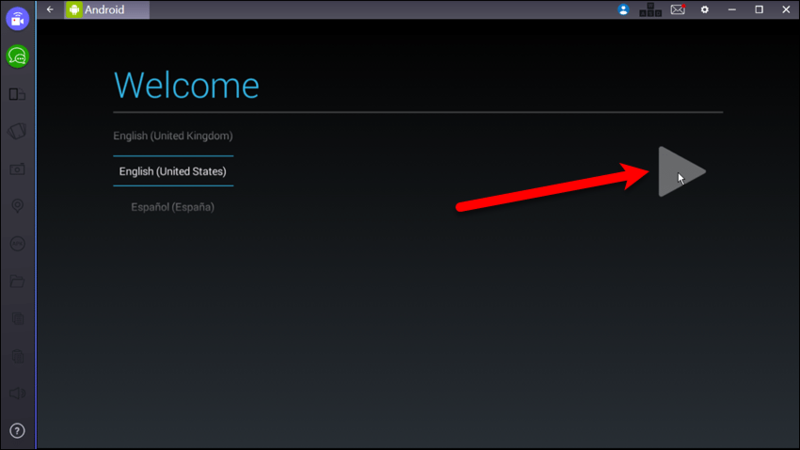 You’ll also be prompted to create a BlueStacks account using your Google account. It’s free to create a BlueStacks account and you get some interesting features. If you’re going to play games with BlueStacks, you can chat with other players online who are playing the same game at the same time as you. Having a BlueStacks account also allows you to sync your settings among all your devices. NOTE: We installed BlueStacks 2 App Player, which is good for running most apps, including games. 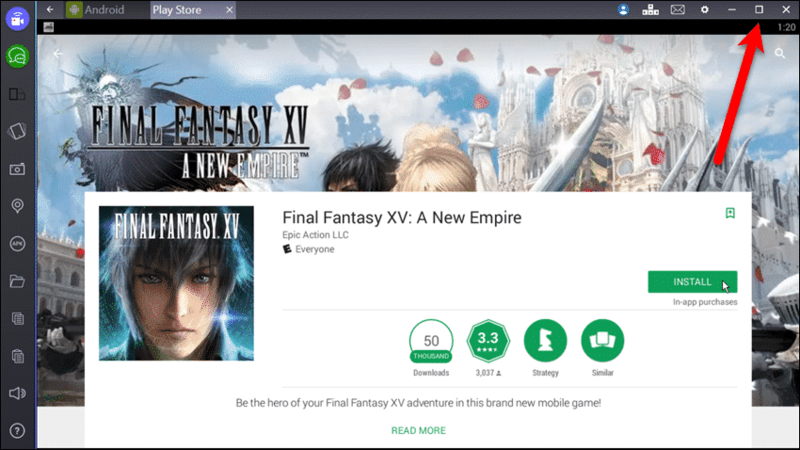 However, BlueStacks 3 Gaming Platform is specifically for gaming and can make use of high-end performance computers and allows you to play multiple accounts in games. 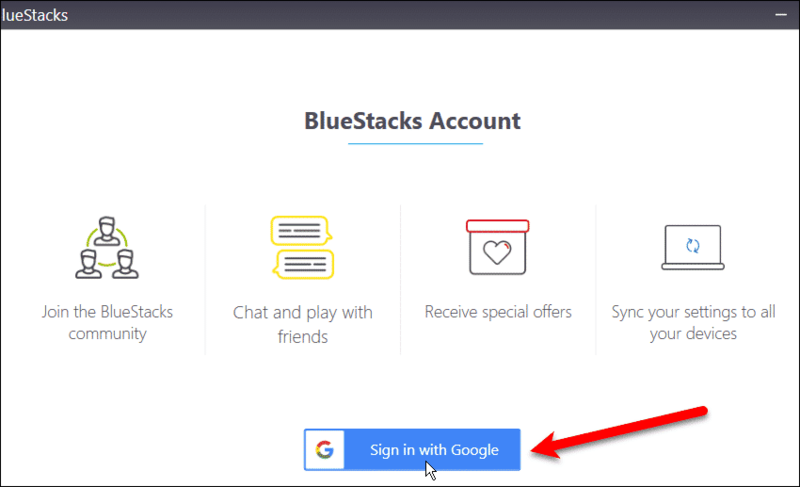 Click “Sign in with Google” and follow the instructions to create a BlueStacks account. 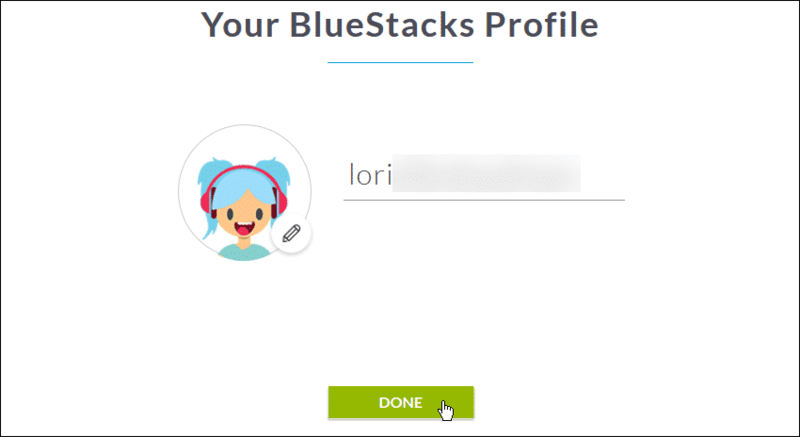 Once you finish setting up your BlueStacks account, you’ll be presented with your BlueStacks Profile name. Remember that and click “Done“. You’ll see a dialog box about improving location accuracy. Click “Agree” – if you agree. Then, if you want Google apps to access your location, click “Yes” on the following dialog box to turn location back on for all Google apps – if you agree. Now, you’ll be asked to set up your “Android device” in BlueStacks. This is just like setting up a new physical Android phone or tablet. Follow the instructions on each screen, and click the next arrow to advance to each screen. You’ll encounter all the usual stuff you do when you set up an Android device for the first time. 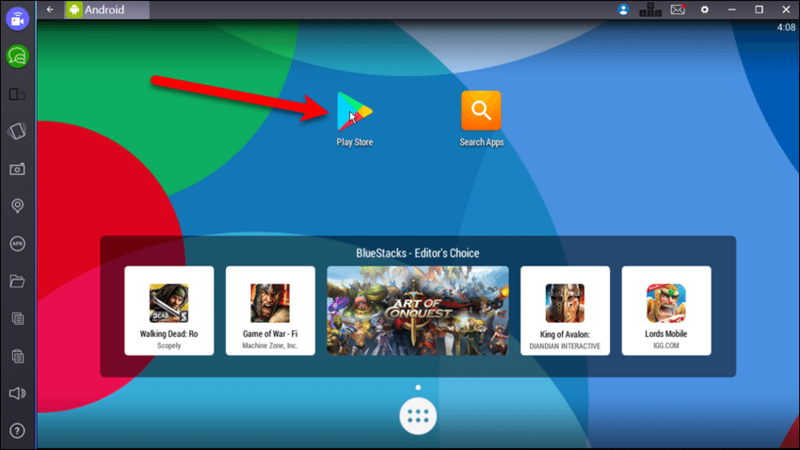 As you’re setting up your “Android device” in BlueStacks, you’ll be asked to sign in with your Google account so you can access the Play Store and other features. 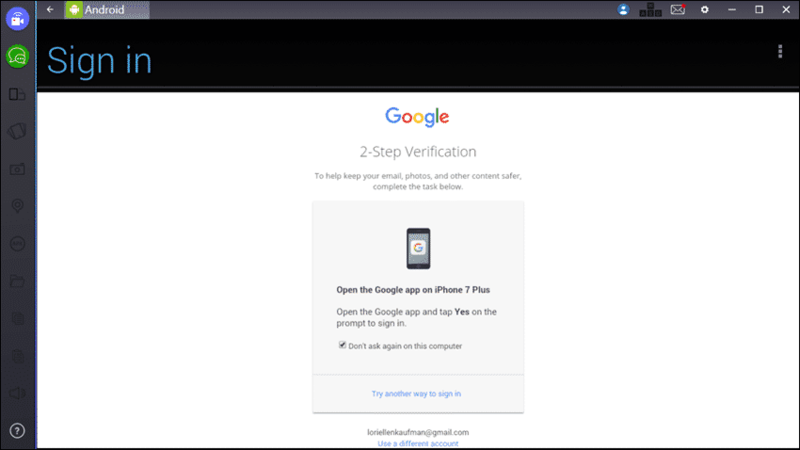 NOTE: When you sign in to your Google account in BlueStacks, you’ll get two security alerts from Google indicating you just signed in to Firefox on Windows and a Samsung Galaxy S5 device. BlueStacks identifies itself as a Firefox browser and the emulation signature it’s using for its Android hardware identifies itself as an Samsung Galaxy S5. You can ignore these email alerts as they are nothing to worry about. If you’ve set up two-factor authentication on your Google account (which you should), you might encounter an error saying Android couldn’t sign in to your Google account. 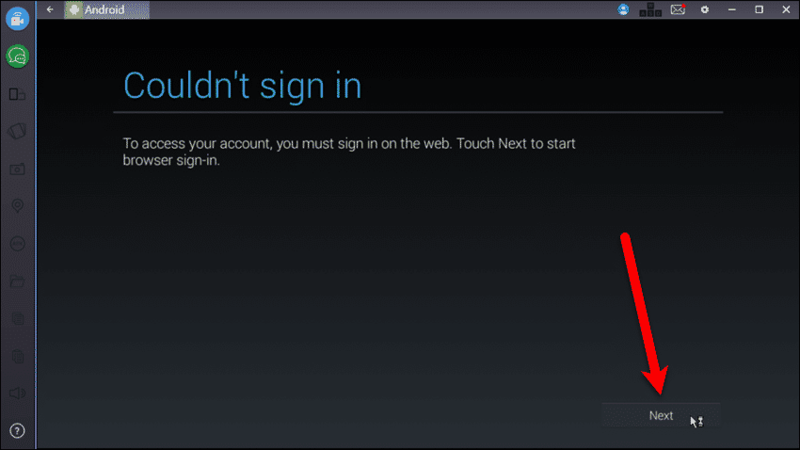 You must sign on the web, so click “Next” to start browser sign-in. You’ll get a notification to approve the attempt the sign in on your main mobile device. Tap “Yes” in the Google app on your device to approve the sign in. Once the setup is done, you’ll see an Android Home screen similar to the one on your phone or tablet. You can “Search Apps” right from the Home screen or open the “Play Store“. 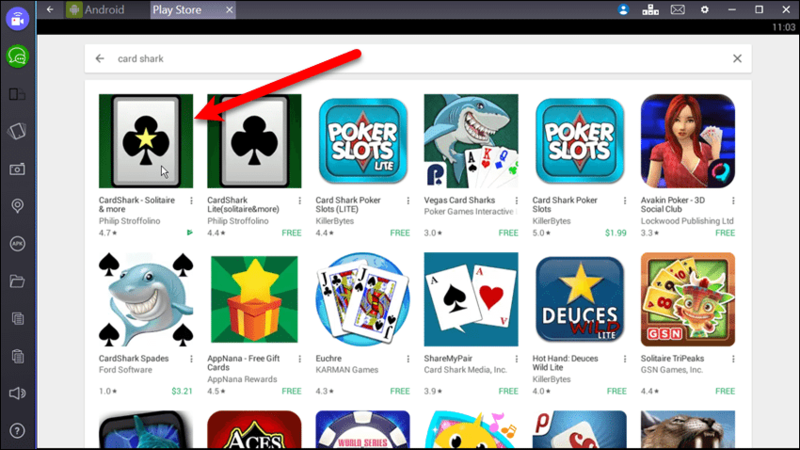 You’ll also see a widget with apps advertised as the editor’s choice picked by the BlueStacks team. We’re going to install an app from the Play Store, so click on that icon. NOTE: Use the mouse to click on icons, just like you would use your finger to tap on icons on an Android phone or tablet. “Control+” and “Control-” can be used for pinch-to-zoom controls. 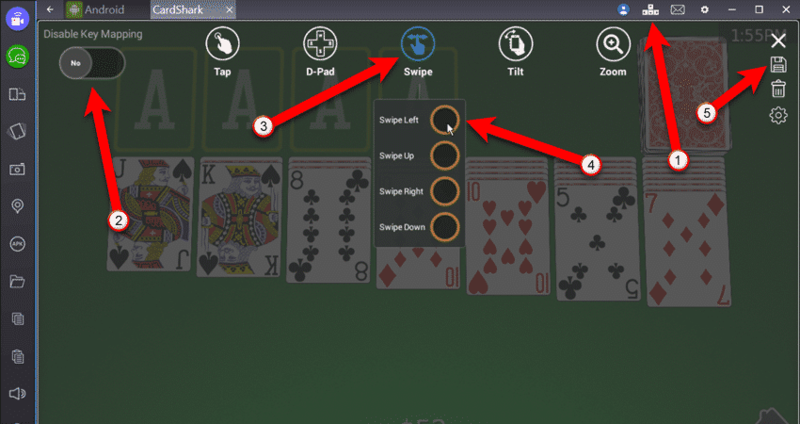 To simulate tilting a device left or right, use the “Z” and “X” keys. Search for an app you want and install and run it just like you would on your Android device. You can customize the keyboard shortcuts used to do things like tap, swipe, tilt, and zoom. Click the keyboard keys icon at the top of the screen. If you don’t want to use the keyboard, click the “Disable Key Mapping” slider button on the left. Otherwise, click the action you want to change, type the keys you want to use and click the “Save” button on the right. Use the tabs at the top of the screen to close apps and switch between the Home screen and open apps. The sidebar on the left side of the BlueStacks window contains controls that allow you to switch device orientation, simulate device shaking, install “.apk” files stored on your computer, or transfer files between the BlueStacks virtual device and your computer. There are also buttons at the top for notifications and settings for both BlueStacks and Android. What Android apps have you used in BlueStacks? Have you used any other methods of running Android on a desktop or laptop computer? Let us know in the comments.